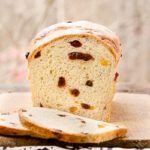 This Fruity Butter Bread has the richness of eggs and butter plus sweetness of dried fruit. Make the dough one day and bake it the next. It's great toasted. Combine flour, yeast, water, cream, eggs, and sugar in the bowl of an electric stand mixer fitted with a dough hook. Knead until ingredients are combined and the dough is smooth. Add salt. Add butter, one tablespoon at a time, until each is incorporated into the dough. You may need to add a little flour (about a teaspoon) along with the butter pieces if the dough becomes too loose and starts sticking to the bowl. Add dried fruit and knead until just combined. Cover bowl with plastic wrap and let rise in a warm place until it has doubled in size, about 1 hour. Lightly grease a 9- X 5-inch loaf pan. Punch down dough and roll or pat to a 14- X 7-inch rectangle. Start with the shorter side and roll up tightly while pressing dough into roll with each turn. Pinch edge and ends to seal. Place dough seam side down in prepared loaf pan. Cover pan with plastic wrap or place pan in a large plastic zip top bag and seal bag. Chill dough overnight or up to 24 hours. Remove plastic wrap from pan or take pan out of plastic bag. Brush top of loaf with egg wash.
Bake until bread is nicely browned and the internal temperature registers 190°F, about 50 minutes. Remove bread from pan and cool completely on a wire rack before slicing. Prep time does not include time for chilling dough overnight.